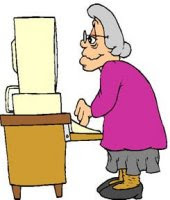 Today I feel about as old as the lady in the clipart. I'm a little under the weather with a tummy ache. I wanted to write about our trip to the hobby store though. We went yesterday instead of the day before because the day before I had too much panic. We didn't go to the one Mr. Skittles wanted to go to yesterday because I still had SOME panic but not enough to keep me inside. We compromised. I went out and he chose a store closer to home. Compromise is a good thing to do. Mr. Skittles has more hobbies than anyone I know. And he does very well with all of them. Models, trains, RC things, tools and building/fixing, etc. Seeing him in a hobby store is like watching a kid in a candy store. At one point I think I even saw him skipping up and down the aisles. Ok.. that part was a lie. But that's how happy he was to be there. He found the colors of paint he'll need for the model, a motorcycle, he's going to build next. I found a couple jigsaw puzzles. On the way to the cashiers he was still seeing things to look at. It was 'ohhhhh look at this' and 'ohhhhh look at that' with much pointing. Then he did it. He pointed at something and said, "Look at THAT, Mom!" I said MOM? Hahahaa.. he had completely reverted to childhood. We've had a few laughs about it since then but I think feeling that young once in a while can't really be such a bad thing. We stopped at a KMart on the way home to pick up a few things. I was pretty tired so we hurried past nail polish and most effective diet pills and I grabbed a box of hair color. We got some new tshirts for Mr. Skittles, too. Then we came home and opened one of the puzzles and spent the rest of the day working on it, with a small break for a tv show we like to watch. Did that store have the wooden 3D jigsaw puzzles? I have a few of those and they are so much fun to put together! I can relate to Mike's excitement cause I get that way too in Joanne Fabrics, Micheals, A.C. Moore's stores here and I'd probably get downright giddy if I ever had the opportunity to go into Herrschners Store up in Wisconsin some time! Oh My! There would be no containing my excitement there, I'm sure! Ah, of course that is what a hobby store sells. Stuff for hobbies. We don't have mega hobby stores. Hobby stores in the Netherlands are more specialized. he probably looked like I do in the fabric store! My wife has all the sensible hobbies. I blog too much. I crochet, read, take care of my critters (two dogs, one cat, one kitten, 12 chickens). Didn't get a garden in this year, but enjoy that too.